A recent newsgroup question asked if there is a way to apply a DataGraphic to all pages in a document. 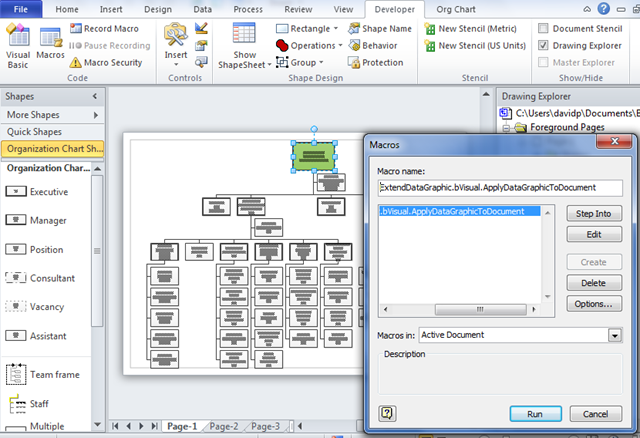 Well, there is no built-in option in Visio 2007 (or Visio 2010), but it can be done with a little bit of VBA. This blog presents a macro that can be used in most cases. 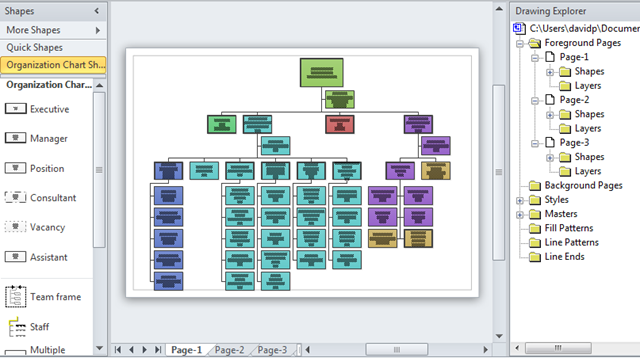 The specific use case was for an Organization Chart that has many pages, and it can be really tedious to make each page active, select all the shapes, then apply a DataGraphic, so I have written a macro that allows you to apply the required DataGraphic to a single shape, then you select that shape; run the macro to apply the same DataGraphic to all shapes in the document that has a Shape Data row with the same name as the the first Shape Data row in the selected shape. The screenshots are from the Visio 2010 Beta, but the code will work for Visio 2007 Professional edition too. 10:         MsgBox "Please select a shape which already has data graphics"
15:             MsgBox "Please select a shape which already has data graphics"